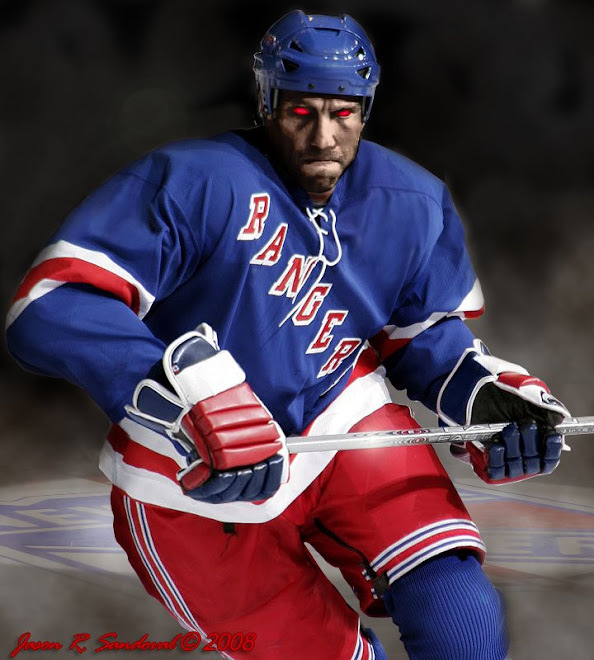 There is nothing like family day at the Garden between two Original Six teams and lucky for all with young children attending Sunday's 1pm game NY Ranger Donald Brashear was a scratch and Boston's Milan Lucic was luckily labeled injured reserve. My four-year old kid was safe for now. With Bruin's Marc Savard also out injured and our often-injured NYR sniper Marian Gaborik starting the game, things were looking up prior to the puck dropping. 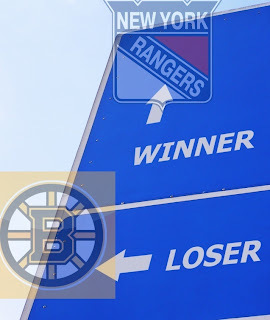 Coming off a two-game slump against two of the worst teams in the NHL (The Minnesota Wild followed by The Islanders), the New York Rangers got back to normal against the Bruins taking a win by one lone goal of the afternoon. It was a good effort by a team that wanted the win, holding a one-goal Marian Gaborik lead - a lovely 'we missed you Gabs' goal fed by Vinny Prospal in the second period - and NYR goalkeeper Henrik "King" Lundqvist back to form - shutting out a third period onslaught of B's storming the net, making 21 career shutouts in the NHL. Oohhh, the love of a win. Games like yesterdays remind me of the barely-nostalgic Tom Renney coaching days - modeled off of the Lou Lammy winning NJ Devils -- DEFENSE is EVERYTHING pre-Tortorella campaign. Looking back, defense is everything if you play it well, but somewhere in the cortex of my memories I recall we didn't play defense very well which led to Mr. Renney's tenure as assistant coach in some very-far-north Province of Canada. Current coach John Tortorella demonstrated yesterday that his blueliners are not only able to score many, many goals, but also when properly focused, control the neutral zone and contain the game. One could look at yesterday's game as average, but I watched the replay after being at the game and the blueline's control of the puck the latter half of the game was masterful. 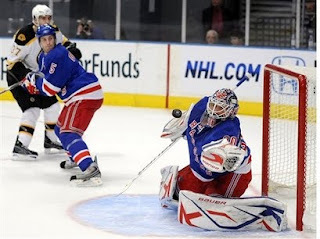 Despite Henrik Lundqvist's continued brilliance in net, the D-men stepped up their game and looked confident again. If I had a nickel for every time I said that this season, I'd have 10 cents. It seems that every team this season has it out for Henrik Lundqvist and one of these games 'the injury' will be real -- note to fellow Blueshirts....THIS HAS GOT TO STOP. DO SOMETHING ABOUT IT. We Rangers fans are sick of seeing no retribution for these cheap' hit the goalie' parlour tricks. The Animal Known As Brashear is not the only person assigned to paying back the team that attempts to break down your castle. Hey, Chris Higgins...if you're not going to score any goals --- drop the gloves! Do something. Enough, enough, enough. We can thank Gaborik, Lundqvist and coach John Tortorella for the win yesterday, where the third period Blueshirts fought back and played defensive hockey -- a responsibility shared by all - defenders and forwards and an elite goalkeeper. Coach Torts lighted up his physical presence as a symbolic player on the ice, with his cranking Rangers keeping things tight on the blueline, controlling the neutral zone and a return of a low-scoring defensive game. In a nutshell, 2 points to us. Thanks Torts. Interesting comparison to Tom Renney as in many ways the Rangers against the Bruins would have been the model type of game that Renney wanted, but Jagr wouldn't let him play. It is much more enjoyable with a team that scores goals even if they lose games. But a win with one goal is a win and we will take it.